Marchand on critics claiming he dove: "That's why they're on Twitter and I'm in the NHL"
The anti-Brad Marchand crowd thought they had a truckload of ammunition to use against the Bruins' agitating left-winger after Game 3, as Marchand again found himself in the center of a controversial play, with his tendency for antics being the chief reason why. 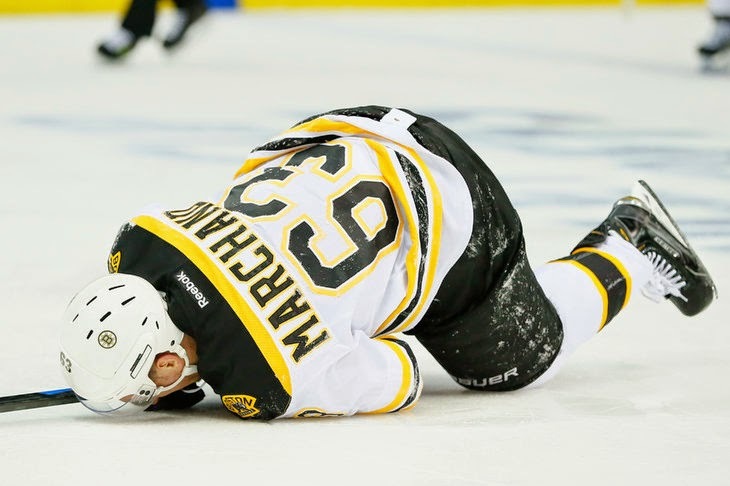 Five minutes through the second period, Marchand was clipped in the left leg by Wings defenseman Brendan Smith. Marchand hit the ice and stayed face-down for a good minute while clutching his knee, all before he needed assistance when heading off the ice and down the tunnel. Upon checking the replay, we see that Marchand gets hit in the lower left leg by Smith, and as he hits the ice, grabs his right knee in pain. Add to the fact that Marchand stayed on the ice for so long, many people thought this was just Marchand at his weasely best, trying to draw a penalty call out of nothing and milk an injury that wasn't for all it was worth. Except this time, people had him caught dead to rights. But Marchand said after the game his right knee flexed backwards after hitting the ice, which was why he reached for it after the play. The replay can certainly back up his postgame claim, as it does show the violent whiplash of his right leg that he was talking about. Or, it could just be another case of Brad Marchand being Brad Marchand.